Terenzio Zardini was a Franciscan friar minor and prolific composer whose output amounted to more than 2,000 works that are still being catalogued. As you might expect, most of these are sacred and liturgical works, and the Messa in Simplicitate for choir and organ spread throughout this programme is emblematic of this aspect of his productivity. Zardini’s music is part of a continuing tradition but is by no means static in its ‘traditional’ nature, absorbing influences of new music coming from the generazione dell’ottanta or generation of the eighties. One of his teachers, Gabriele Bianchi, was student of Francesco Malipiero, so lines of musical descent can be traced without too much difficulty. I’m a big fan of Olivier Messiaen, and when sampling bits of this CD online I was attracted to it for similar reasons I like Messiaen’s organ music. There’s a spiritual wealth and sense of optimistic lightness as well as all of those liturgical dramas which make for fertile ground. It’s hard to ignore the French tradition when it comes to organ music, and Zardini was clearly aware of Messiaen in his invention of personal tonalities. There are some echoes of this in a style that at times has fragrances of Dupré, Duruflé and others, but you are always aware that there is a different mind at work. La Pieve di Cascina is subtitled Impressione per organo and is full off eccentric touches such as the addition of chimes. Modality and a sense of close ecclesiastical feeling are shared characteristics in the smaller pieces such as the Meditazione serafica, the gentle Interludi and the opening of the Corale sull'inno natalizio “A solis ortus cardine” which develops a considerable head of steam, while the more dramatic Fantasia sul Do even has some swinging syncopations. This is by no means a monotone selection, and there is surprise in the sheer variety and expressive range on offer here. Most substantial of the organ works is the Sonata 1, a magnificent and ambitiously wide-ranging three-movement work that fully explores the colour and depth of the organ as well as developing some remarkable musical edifices. Technique aplenty is on show here, but not in a dry and academic way. Zardini is quite capable of throwing in moments of fun and wit even where the works are being taken on as far a journey as possible. As its name implies, the Messa in Simplicitate is a gentle and expressive Mass setting with an archaic feel in its use of modal quasi-plainchant and open textures, allied to a Romantic melodic charm. The women’s choir performing these movements is not the best in the world, but the music is adequately delivered and would be the kind of liturgical and even concert piece with wide usefulness. As a bonus we also get the lovely little Minuetto for orchestra recorded live in the presence of the composer — a moment of tranquillity and atmospheric eloquence given a fine showing in this performance, which is rounded off with a brief pattering of applause. I picked this CD for review suspecting I would like it, and I am glad to report being proven correct in my instinct. 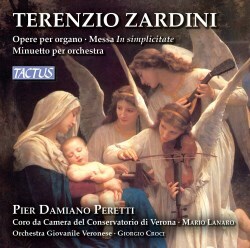 The best of the organ works are very fine indeed, and all are given superb performances by Pier Damiano Peretti. The Messa is less musically interesting but still an intriguing discovery, and the addition of the Minuetto seems to fit well despite being a bit of an odd man out in terms of the programme as a whole. Well recorded, this is a tasty selection of quality music by a name who will be new to most of us, and I recommend its Italian warmth and sincerity.